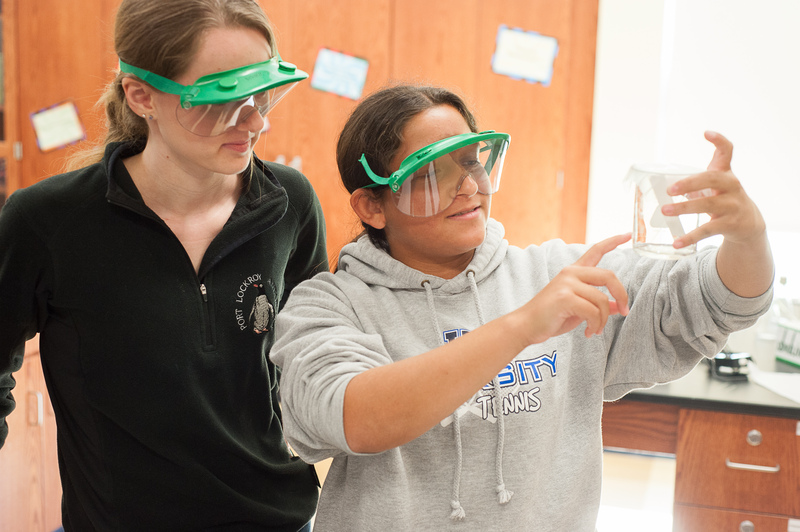 University High School offers a well-rounded science curriculum that features standard 9th and 10th grade courses (Biology and Chemistry, respectively) as well as several advanced and AP science options for upperclassmen. To graduate from University High School, students must earn six credits (one credit is earned each semester) in science. University’s science classes feature a variety of hands-on learning opportunities that allow students to experience the process of science. Teachers incorporate technology into both the laboratory and lecture/discussion portions of each course, and they emphasize the interconnections among various science disciplines with applications to real-world experiences. Assignments in science courses vary according to students’ learning styles and processing skills. This course serves as an introduction to biology. Students learn about cellular and molecular biology, genetics, evolution, ecology, and some of the systems of the human body. In addition to learning factual information in each of these areas, students are expected to explore the interactions and interrelationships of the different fields. This is accomplished through frequent experiments, paper-and-pencil activities, and in-class discussions. The course emphasizes biology as a dynamic and growing field of study by including in discussions and activities areas where knowledge is changing and expanding. It is important for students to understand that biology is not simply a finished subject found only in a textbook. This is a first-year, laboratory-based course designed to give students an opportunity to explore a variety of topics in general chemistry. Chemistry is the study of matter, its structure, properties, and composition, and the changes that matter undergoes. In this course, students will study the fundamental principles of chemistry, which allows them to study all the major subdivisions of chemistry in greater depth in future courses. The laboratory portion of this course reinforces concepts and processes discussed in class and provides a hands-on experience that directly connects with the lecture/textbook material. During the lab, students will use LabPro units attached to their computers to collect and analyze various types of numerical data. Students will usually work in pairs during the lab. This course covers topics such as Newtonian mechanics, electricity, magnetism, energy, optics, waves, and selected topics in modern physics. 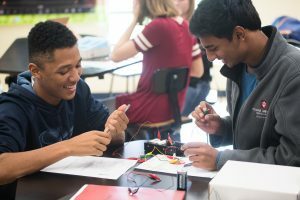 Students will explore these topics both qualitatively and quantitatively through hands-on experiences and class discussion. A willingness to engage oneself in deeply scientific thought and analytical challenge makes this a rewarding course. This course explores the anatomy and physiology of the human body. Students study the major structures within the body on both a macro- and micro-scale, learning to identify those major structures using appropriate vocabulary. Students build an understanding of how the various parts are arranged and interconnected. Students also study how the different systems within the body work, in addition to learning what signals are used and what pathways are followed. While studying the structures and functions of the healthy body, students also learn what happens when there is a malfunction or disease. By the end of the course, it is expected that students have an increased appreciation for and be able to discuss the structures and functions of the human body in an informed manner. The course offers a broad survey of modern understanding of the cosmos and how astronomers have built that understanding. It assumes no prior knowledge of astronomy or physics, but it does occasionally use basic algebra. It emphasizes process as well as facts and is a solid introduction to how science is done. Because astronomy is an observational science, the student will use computerized laboratory exercises to collect and analyze data. From ancient views of the solar system to the existence of extra-solar planets, from the birth and death of stars to black holes, from globular clusters to near and ancient galaxies, from familiar cosmic geometries to exotic ones, the course helps students understand their place in the universe. Environmental Science: Human Impact is an interdisciplinary science course that builds on foundational knowledge of biology and chemistry. Students will be able to evaluate the complexity of environmental problems our world is facing today through a scientific lens, preparing them to make informed, sustainable decisions from scientific and societal information. The course will focus broadly on demographics, agriculture, solid waste management, energy resources, and climate change. Students will become versed in systems-thinking and gain an understanding of the interconnectedness of our world. Students will also study interactions at scale—from a single individual to 7.6 billion people—and at varying levels—from local to global. Much of the learning in this course will occur through frequent experiments, computer simulations, and outdoor field work. Outdoor field work on campus and at off-site locations will occur weekly and be major components of the course. Students do not need to have prior outdoor knowledge or skills; however, they should be ready to participate under a variety of different weather conditions. Remember, there is no such thing as bad weather, only bad gear! This course is equivalent to a first-year college general Chemistry course. It will build upon the chemistry principles studied in a first-year Chemistry course and explore new topics. The following topics will be covered: measurement, atoms, chemical bonding, chemical reactions, states of matter, solutions, equilibrium, acids/bases, thermodynamics, reaction rates (kinetics), electrochemistry, organic chemistry, and coordination chemistry. There will be greater emphasis on the mathematical formulations associated with these chemical principles than in a first-year Chemistry course. Students may work independently or in pairs in the laboratory, and the laboratory activities will reinforce concepts and processes discussed in class. The nature and variety of laboratory experiments will also be more detailed than in a first-year Chemistry course. During the lab, students will use LabPro units attached to their computers to collect and analyze various types of numerical data. Zoology is a laboratory science emphasizing the process of scientific investigation through the study of living things. The course is specifically designed to study the major phyla of the invertebrate animals: Porifera, Cnidaria, Platyhelminthes, Nematoda, Mollusca, Annelida, Arthropoda, and Echinodermata. Invertebrates account for 95% of the animal diversity on our planet. We will explore this amazing degree of diversity through lecture, animal dissections, behavioral labs with living organisms, and guest speakers/field trip. The overall goal of this course is to foster a deeper appreciation for non-vertebrate organisms and to encourage a hands-on approach to science. Zoology is a laboratory science emphasizing the process of scientific investigation through the study of living things. The course is specifically designed to study Phylum Chordata and the major classes of vertebrate organisms. We will use the overarching themes of evolution, animal design, and comparative body systems to explore the differences between vertebrate organisms. Lecture, animal dissection, outdoor field days, guest speakers, and field trips will be used. Students will also be required to study and learn local Indiana species identification. The overall goal of this course is to foster a deeper appreciation of vertebrate organisms and the evolution of their specific adaptations. This course is a college-level course designed to challenge students to extend their knowledge of biological theory and processes. Students will increase their factual knowledge of biology. The course will provide students an understanding of the larger concepts and underlying themes of biology, and in addition present biology as a dynamic process. The themes covered will include evolution, energy transfer, continuity and change, regulation, interdependence in nature, structure vs. function, science as a process, and science in technology and society. In general, the course content will follow that set by the College Board for an AP Biology course. The goal of this course is to provide an introductory college-level understanding of calculus-based mechanics, electricity, and magnetism. This will be done through student-driven discussions, problem solving, and laboratory experiments.